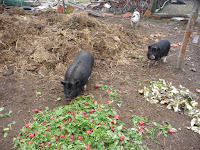 Pigs are great animals, they eat virtually anything, dig up the ground, produce great manure and are really fun animals. The only problem with pigs is the feed. 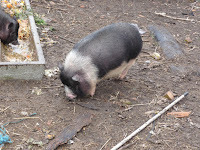 Normal domestic pigs eat loads and without harvesting grain, pigs are prohibitively expensive. 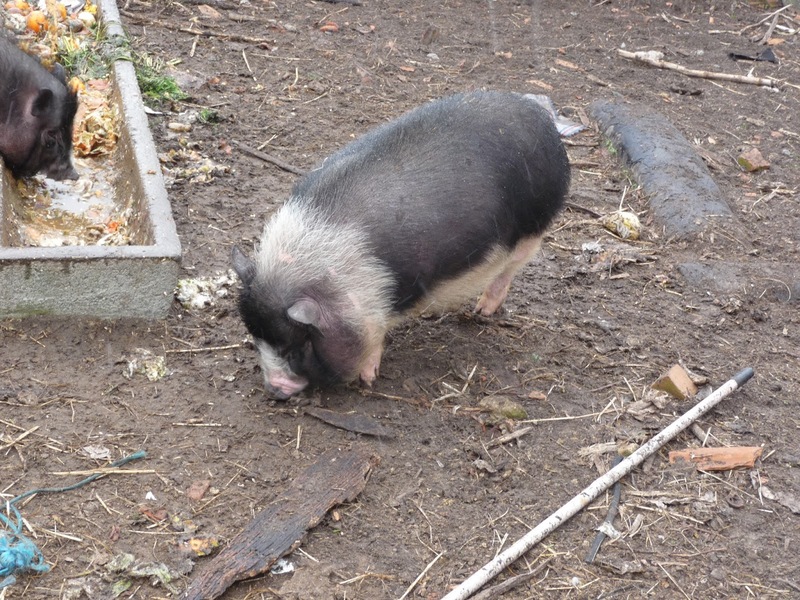 The solution to all the problems is a mini pig! 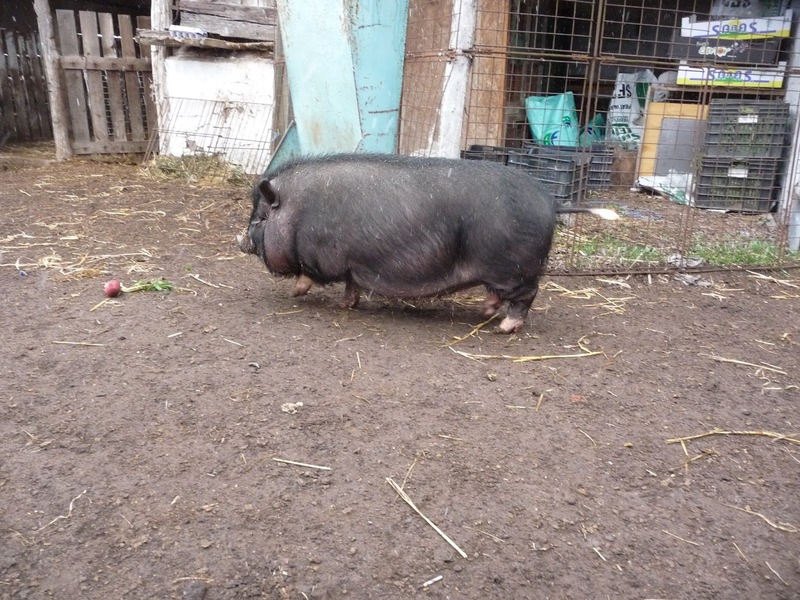 These pot belly pigs grow only to 50 kgs and they don't need lots of food whilst providing all the benefits of pigs. 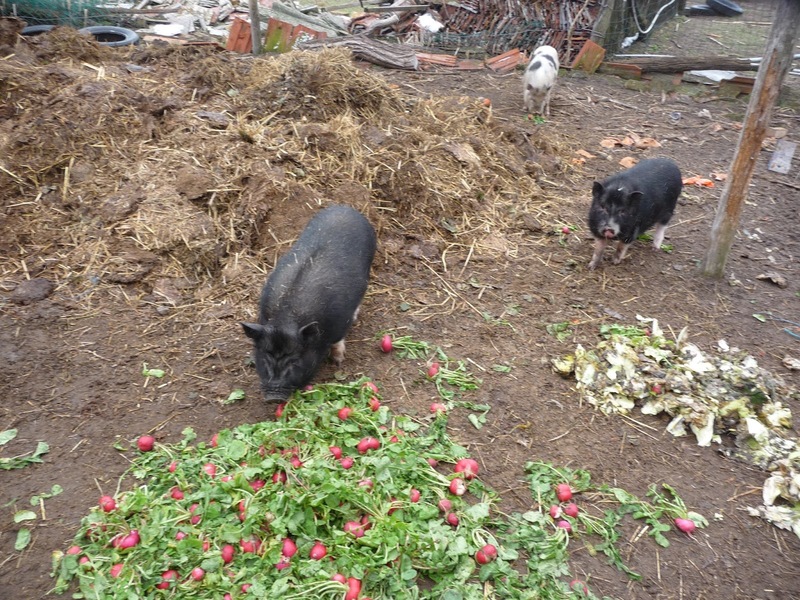 Zolibacsi also has a continuous source of reject vegetables which will keep these pig ticking. I've finally returned to health and one of the first things I've been up to is reclaiming our inner garden. This has usually been a dumping ground for rubbish and a place of growth of weeds. However, inspired by our Swedish friends, I've reclaimed the ground for an inner kitchen garden/flower bed. First, a lot of the travelling weeds/trees/plants and a dodgy fence had to be removed to leave naked soil. The idea is to cover bare soil with a biodegrade material of various sizes which then holds in the moisture, and makes weeding easy. The ideal material is wood chip but I had a couple of bales of old rotting hay in the back field. This complemented with some well-trodden, weed and pooed straw/hay from the sheep will make a excellent first attempt. The plan is to let the ground recover and start planting in the spring. The covering is about 30 cm deep all over. 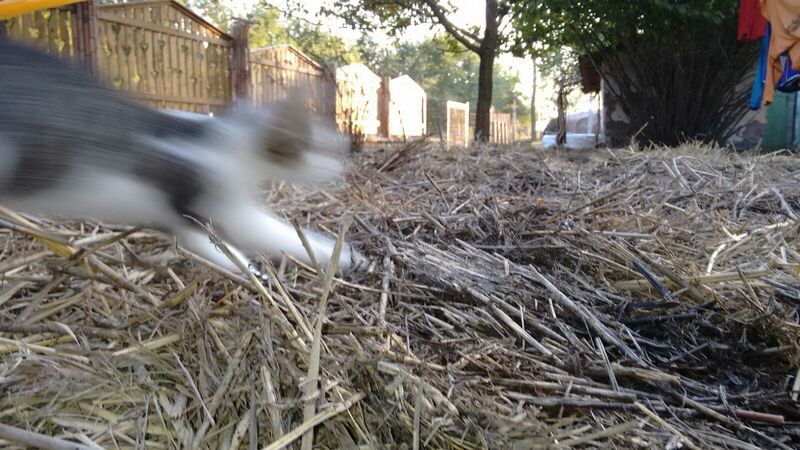 Also, there is a less spotted relativistic cat approaching the speed of light in the second photo! The sit-down mower will be used as farm tractor and can be used a lawn sweeper (picks up cut grass, small twigs, leaves and sheep poo), a grass dethatcher and trailer which is highly useful. The remaining areas can be treated with the exceptionally noisy scissor mower, now fixed after snapping the drive belt! this time just a 3000 HUF replacement. Other rivotting news includes the replacement of the pressure switch on our home well water system. This switch was over 40 years old and the contacts have worn away, mainly from frying mice which borrowed into the connection. Our electrician friend, Csaba, found a replacement and installed it (a non-trival situation considering the wiring) and now our house has 3.5 bar water pressure :) I'm looking forward to saying goodbye to the days of showering under a drip. 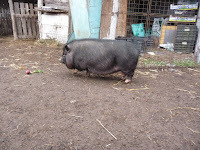 Andy is finally on his feet and slowly limping around the farm. 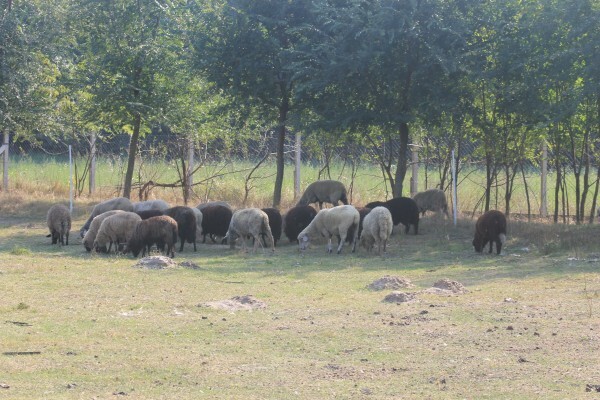 The sheep count is up at 20 - We've about 8 black racka now - This is the last year of Heepy being our active ram - Next year we will swap him out to make sure that there is no inbreeding. Most of the original trees on the farm are dead or on the way out - We've hired a tree surgeon who has felled and sorted the trees. 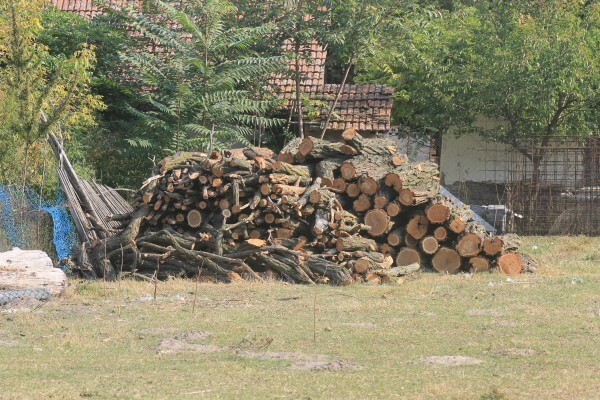 We should get some planks of various lengths and lots and lots of firewood from these trees. We need to plant lots of trees so that we can have firewood and new fruit trees. The last batch of young trees have been successfully killed off by the flock of sheep who preferred tree bark to hay. 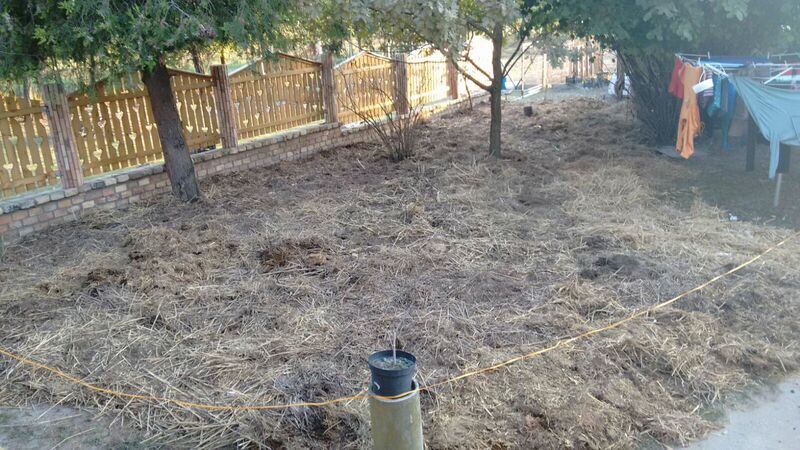 The problem is that the areas that are suitable for planting are very exposed. The lovely Graham and Sue came out to help us with the sheep management. With their excellent help, we've managed to partition the orchard and former vegetable patch from the sheep. 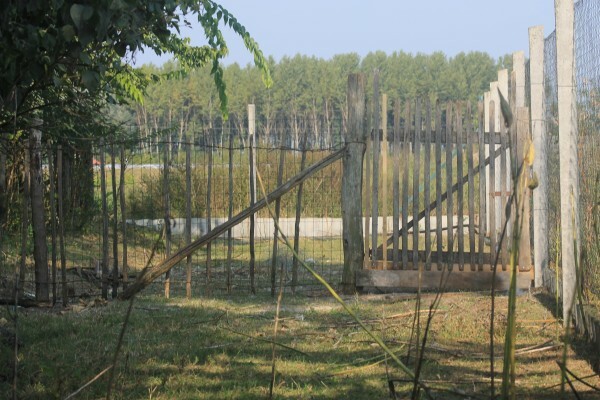 We've reused old fencing and gates, reinforced with pig-wiring around the orchard (pictured) and then laid an electric fence with two spring gates to seal off the former veg patch. Digging out the old posts were challenging even in the sandy soil as at the base of the 2m post was a wooden cross prevent us from pulling them out of the ground. Ragweed is the bane of our farm. It grows in every nock and crany; it grows fast and strong and when flowers, causes hayfever for virtually everyone around. This summer, we've had rain, sun, heat and the farm has turned into a ragweed jungle. We can also get fined by the local government for excess ragweed. 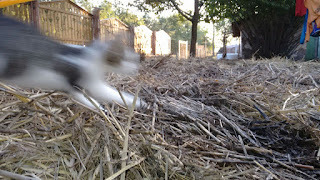 Usually, every summer at the crack of dawn, I get up and strim down the jungle and try to pull up the weeds. However, the last two years, I've been unable to walk over the summer, let alone use light machinary due to 100% snapping my right (2015) and left (2016) achilles tendons. Sorry for the lack of blog activity, We've been distracted with other things. Anyway, This year we've had a good run with lambs with all our girls getting pregnant. Unfortunately the Racka lamb didn't make it but we've three strong lambs from Heepy, our Ram. In all the craziness of last year, we forgot to mention that we bought a new car. Here is the new cheesemobile in all its glory. It is a 20 year Suzuki 1.6L petrol 4x4 which comes highly recommended by the local vet and mechanics.